This second book in the Holy Cross Studies Series offers an ecumenical roster of leading scholars who examine how the early church once understood and interpreted apocalyptic writings in light of theology, social practice, and cultural institutions. 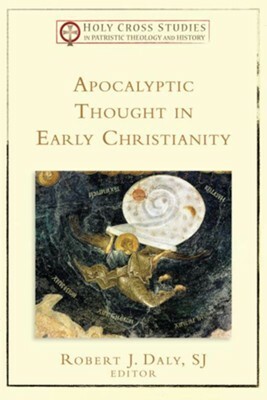 Edited by Robert J. Daly, Apocalyptic Thought in Early Christianity gathers together experts in the fields of Patristics and Byzantine Christianity to explore subjects such second coming imagery in Middle Byzantine art, the depth of meaning the early church found in Daniel, Revelation, and related writings, turning points in early apocalypse exegesis, and the theology of antichrist found in baptismal catchesis. These exceptional essays include contributions from Brian Daley, Bernard McGinn, and John Anthony McGuckin. This volume explores how early Christian understandings of apocalyptic writings and teachings are reflected in the theology, social practices, and institutions of the early church. It enables pastors and serious students of the Bible--particularly those interested in patristics and church history--to read the book of Revelation and related writings through ancient Christian eyes. Robert J. Daly, SJ (DrTheol, Julius Maximilians Universit&auml;t Würzburg), is professor emeritus at Boston College and chair of the Pappas Patristic Institute's board. He is the author, editor, or translator of many scholarly books and articles on the early development of doctrine, patristics, biblical theology, biblical ethics, and liturgical worship. I'm the author/artist and I want to review Apocalyptic Thought in Early Christianity - eBook.